CALGARY - The Insurance Bureau of Canada says the June flood in southern Alberta was the costliest natural disaster ever in the country. The bureau said Monday the latest estimate of the insured property damage now exceeds $1.7 billion. "This is a significant catastrophe and not like anything we've really seen in Canadian history," said Bill Adams, a bureau vice-president. "Once all the numbers were compiled the tally is $1.7 billion, with the anticipation that it is likely to go higher." 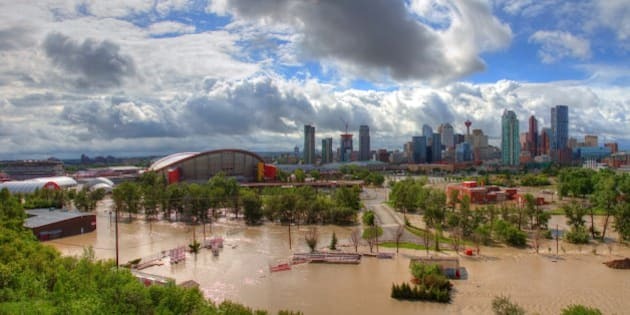 Four people died and 100,000 others were forced from their homes by days of torrential rain, prompting states of emergency in Calgary and several other communities. Adams said most of the damage claims for insured losses were for sewer backups, vehicle repairs including writeoffs and business losses. Property Claim Services Canada, which tracks losses arising from catastrophic events, said well over 25,000 claims have been filed in the flood's aftermath. Adams said it took more time to assess the damage due to the extent of the flooding and the number of claims. "Business interruption insurance, for example, typically takes a little longer to settle until the business gets back to operation," Adams said. Annual payouts from flooding, fire, hail and windstorms increased from $100 million about 10 years ago to $1 billion between 2009 and 2012. In November 2011, officials had to shut down Calgary's downtown core because extreme high winds blew windows out of buildings. Earlier that year, a wildfire ravaged the community of Slave Lake, Alta., with insured losses pegged at more than $700 million. Those pale in comparison to the latest Canadian disasters. "Canadians have been alarmed at what they've been seeing over the last while when you look at both the southern Alberta and the flash flood that took place last July in Toronto," Adams said. "Those two events, just this summer, constitute the first and the third largest natural insured catastrophe in Canadian history." Adams said in the past most insurance claims were fire-related. Now water is the chief culprit. Earlier this year the insurance bureau urged municipalities to fix crumbling storm-water infrastructure to prepare for more of the same in the future. "We know that it's likely to happen again. We certainly hope it doesn't happen at this magnitude but we see what's taking place and we're not sitting idly by any stretch of the imagination," he said. Federal Public Safety Minister Steven Blaney said last Tuesday that Alberta may soon get an initial interim payment of $500 million from Ottawa to help cover flood costs.